Wisdom of Life. 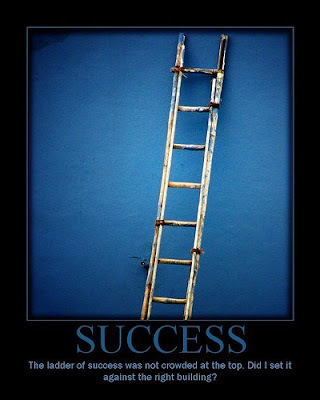 : The ladder of success. Was sad to see my fellow colleague, YF down with depression. She has been an agent for more than eight years. She had not been doing well in her business. When I met her recently, she failed even to secure the appointment with a prospective client for that day. She had to wait for this prospect for more than an hour, before he texts a message to inform he had a board meeting. Apparently the prospect took her for granted without even realising how she felt. This rejection made her valueless and unwanted. If continue with more rejections of such, I believe YF might even have to leave this profession. The above incident is common to many aspiring agents who have been in the business for more than three years. The first three years are achievable years, when agents could sell to many of their acquaintances. Usually the first or second policy is easier to sell, especially to those they know. Regrettable not many agents know how to sell with different skill as they pursuit further this career. They are not taught to understand the right way to review present clients need and expansion. How to develop confidence when they meet new prospects. Not forgetting, when they try to identify prospective clients with value, these intelligent prospects could also be assessing their personality and skill. A successful agent speaks with confident and strength. Comparing with an unsuccessful agent who might speaks with desperation. A successful agent has the skill to lead and control his prospects. Whereas the unprofessional agents are usually dictated by their prospects and clients. If you profess and image to be a true professional agent, I believe all prospects and clients will respect your value. Otherwise, the unprofessional one might be taken just like a salesperson. In order to help YF, I had to be direct to her. She had not sold as a true professional agent. Is high time she has to change her way of selling life insurance. Can't blame her prospect for taken her for granted. He knew she needed the sale more than he needed the cover. He was smarter than her in the first place. Food for the thought - "Strength does not come from physical capacity. It comes from an indomitable will" - Mahatma Gandhi.